Do you, a family member or a friend suffer from the painful symptoms of Eczema or Psoriasis? Are you looking for an eczema treatment or a psoriasis treatment? 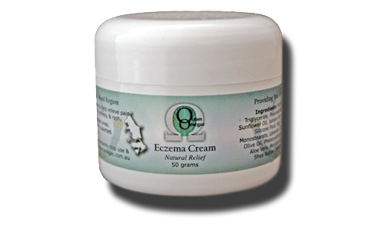 Ocean Omegas Eczema Cream moisturizes & nourishes to help RELIEVE the pain & inflammation associated with eczema and psoriasis. You can get relief from these painful symptoms today using this natural eczema treatment. Ocean Omega products provide you with the highest quality Omega 3 & 9 oils. We have many testimonials from people who have had their lives improved after using Ocean Omega products – just read the testimonials under the information menu. Plus you can contact us for more information about this amazing natural product from the ocean. Ingredients: Purified Water, Sweet Almond Oil, Caprylic-Capric Triglyceride, Polyoxethylated Fatty Acid Ester, Glyceryl Stearate, Glycerol, Sunflower Oil, Juniper Berry Oil, Cetostaryl Alcohol HILB 8.9, Ceteareth 20, Silicone Fluid, Butyl Carbamic Acid, Lodopropynyl Ester, Glyceryl Monostearate, Lavender Oil, Bergamot Oil, Jojoba Oil, Myrrh Oil, Coconut Oil, Olive Oil, Phenoxyethanol, Xanthan Gum, Alpha Tocopherol, Cocoa Butter, Aloe Vera, Avocado Oil, Calophyllum Oil, Mutton Bird Oil, Apricot Oil, Shea Butter, Disodium Edta, Tea Tree Oil, Kunzea Oil, Fragrance. During a recent visit to Strachan we visited the Gordon River cruise gift shop where my daughter discovered the sample pots of your Eczema and Arthritis creams. She said I should try the Eczema cream as for many years I have suffered from very itchy ears, especially when under stress, which resulted in broken, scaly skin, even to the point that the skin had thickened. I tried the cream before we ventured on board the cruiser and can honestly say I did not scratch during the whole trip, a fact my daughter later commented on. We went back to the gift shop but unfortunately they were out of stock of this product. We later found it at the Salamanca Markets and discussed its use with the lovely lady there, she also said that the Arthritis cream would probably help me as I have quite nasty arthritic fingers. I have been using the cream now for about two weeks and there is a very noticeable improvement not only in the itching but also skin texture, hopefully I have broken the cycle. I have used all sorts of creams, even steroid creams and was taking anti-histamines each night to alleviate scratching in my sleep – have not had a tablet for the last 3 nights. I must say I am very impressed. As I live in NQ would it be possible to purchase the Eczema cream in 100g pots, and could you give me cost of same, if available. Thanks for your wonderful products.